Full disclosure… this dish is not very photogenic, but it is tasty! This sautéed spinach is not your typical steak house version that is full of garlic and oil. 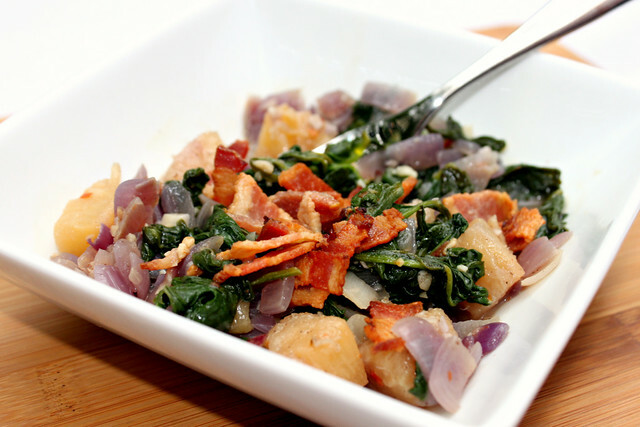 This recipe has a savory and sweet profile because of the red onions, bacon, and pineapple. One thing I have learned is that you should buy more fresh spinach than you think you will need. The recipe below calls for 10 oz of fresh spinach, which seems like a lot, but cooks down so much that it only equals about three servings. The Perfect Pairing for this dish is leftover bacon you have in your freezer. When I buy bacon for a recipe, I rarely need the entire package so I toss the leftover in the freezer. I can’t stand defrosting meat in the microwave. I always cook it too long and it gets rubbery around the edges. Blech. I hate that! I saw a great tip on the Food Network about using bacon directly from the freezer when you need bacon pieces. Pull out the frozen bacon and put it directly on a chopping board. Don’t worry about trying to pull the pieces apart. Using a sharp knife, cut small pieces off of the end of the bacon strips until you have enough for your recipe. You can put the frozen bacon pieces directly in the pan and break them up once they start to defrost. In a large skillet over medium heat add the chopped bacon. Cook until crispy, remove bacon with a slotted spoon and drain on a paper towel. Add chopped red onion to the pan and cook until translucent, scraping the bottom of the pan. Add the drained pineapple, garlic, and pepper flakes, stir and cook until the pineapple is caramelized. Add the spinach to the pan in batches; add 2 Tb of the reserved pineapple juice, stirring spinach until it wilts down. Add more juice, if it seems too dry. Season with salt and pepper, to taste. Top with crumbled bacon.